Bruce Backhouse is a full-time artist based in Johannesburg. He focuses primarily on landscape, executed in watercolour. Backhouse although very versatile in figural satires, is concerned primarily with the contemporary landscape, falling within the genre of traditional landscape painting. 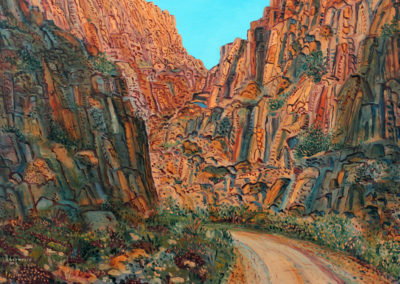 He believes that the average South African landscape has been over exploited to a point where it is no longer visually challenging to either post-modern artist or viewer. In trying to review this genre, his aim is to make people question and think differently about landscape in watercolour, it is a journey for both artist and viewer. The medium of watercolour is one that historically has often been used as means for the topographical recording of our natural environment. It is one also that historically became the British middle-class answer to affordable works and one that had and still has issues of a “different and lesser value system” to that of oil painting. Backhouse gives a lot of thought to these issues within the works, forcing his viewer to critically address value system preconceptions through presenting a varied contemporary vision of a singular static landscape, in a traditional medium, with a multivalent vision. 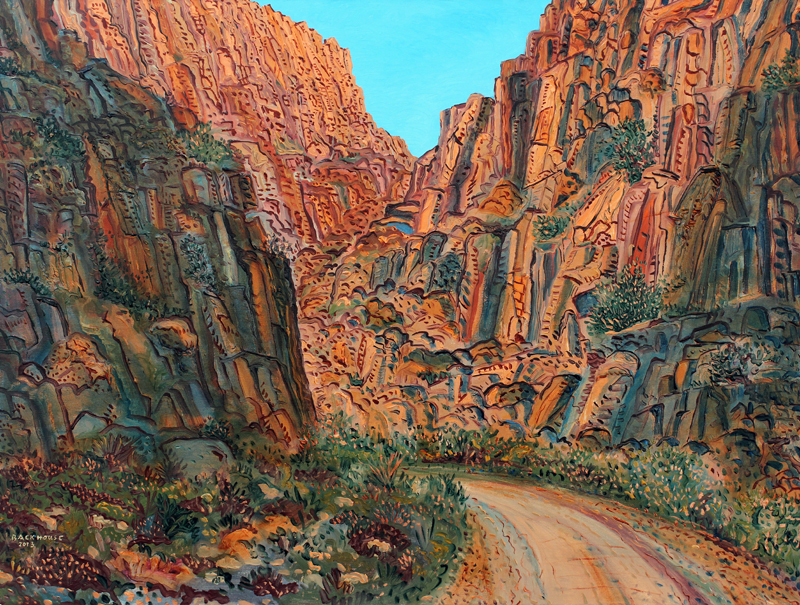 If pointillism challenged the mark making within a pictures view, Backhouse uses a multiple view to achieve a similar end on a larger scale, by presenting many vignettes within a single vision. The premise from which Backhouse departs is that he believes that the modern visual ability of the viewer far exceeds any other period in history. The plethora of technology available to us in the form of multimedia, television, email and sms has expanded our ability to comprehend and process and our desire for more complex visual stimulation. The notion of editing in the minds eye is a key focus, he likes to supply the viewer with as much information as possible where you might have several views of the same landscape from different points and under different weather conditions. He believes this perspective to be more true to nature. This allows the viewer a multiple truth, with the ability to zoom in and out of the visual space from different points and under different conditions, presenting a multiple reality and no singular “truth”. This evolution of the viewer is key to the fundamental premise upon which the works are formed – Backhouse aims to supply more visual material for the viewer to assimilate, valuate and enjoy. “This is a key element of what I am trying to communicate”, he says. “The single snap shot of one time is now a multiple view landscape, relating directly to our environment in the technological age and the viewers growing visual sophistication”. Backhouse quotes Nietzsche “God is in the details”, saying that his work encapsulates both large and small issues simultaneously. The amazing range of mark allows immense detail to co-exist with abstract planes of form, and the viewer is forced to zoom in and out to assimilate the whole. The viewer is as active as the painter. His influences are critical to his thought process and range from Andy Warhol and Jim Dine as urban artists, to David Hockney and Steinberg for their colours and line, and use of mark. Studied fine art at Rhodes University for 2 years under Brian Bradshaw, 1970 – 1971. Gained work experience as an Art Director and Creative Director at various ad agencies in South Africa for 25 years. Illustrated ad campaigns, magazine covers and newspaper articles during this period. MD Image Bank South Africa 1997 – 2004. Became a full-time artist in 2004. Studied at the National Portrait Gallery, London, 2006. 1980: Solo exhibition at The Market Theatre Gallery. 1982: Solo exhibition at Ronnie van der Walt Gallery, Melville. 2007: Launch Solo show of David Krut’s new space, Johannesburg. 2007: Exhibition at UNISA gallery, “David Krut Prints”.